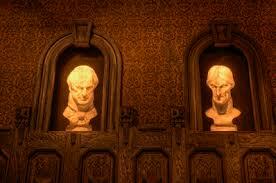 The bust effect, patented by Disney, was achieved by creating inverted busts: they actually recede into the wall. A combination of dim lighting and optical illusion makes the busts appear to stare at the passing guests. A similar effect is used in the Hollywood Backlot section of Disney California Adventure. The endless hallway has a mirror placed at the end of it that fools the guests into thinking they can see twice as far down it as they actually can. The mirror has a scrim over it which serves two purposes: first, to make the corridor appear to stretch away into the mist, and second, to deaden the reflection of the candelabra - the back of which is painted black - in the mirror. 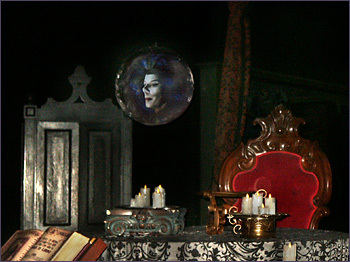 The Leota effect is accomplished through digital projection of an actress (Leota Toombs)'s face onto a head sculpture with features of the actress. At Tokyo, the movement of the cable-suspended sphere is synced to the projection via computer-control (what Anaheim had originated), while in Florida the projector is located inside the Crystal Ball. 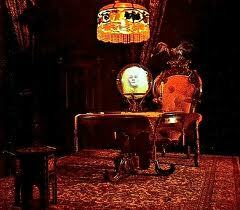 In Tokyo, when the projection is not correctly synchronized with the movement of the bust, Leota's crystal ball rests in a cradle on the table. The other floating objects in the room are held up by fishing lines. 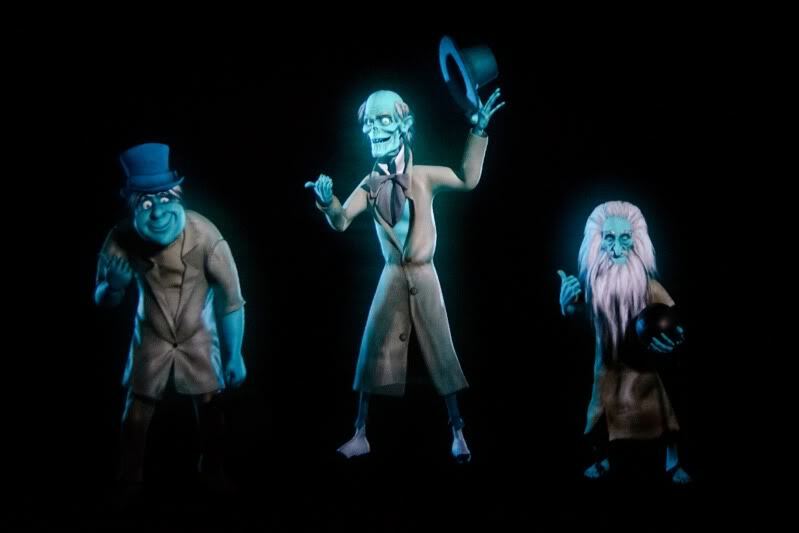 Constance Hatchaway, the singing busts in the graveyard, and the Ghost Hostess are also created using the same projection technique as Madame Leota's. The ghosts in the ballroom are commonly believed to be holograms. 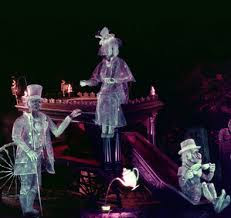 However, all the ghosts in the ballroom scene are created using a clever variation of Pepper's Ghost, an illusion invented in the mid-19th century. 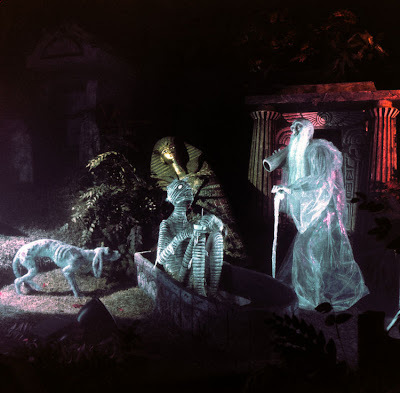 The version of the illusion in the Haunted Mansion works like this: a row of columns in front of the mezzanine are supporting gigantic panes of glass, which are nearly invisible to the guests. 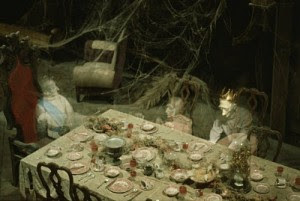 The "ghosts" are merely the reflections in the glass of audio-animatronic figures, located in rooms above and below the mezzanine, where the walls are painted entirely black. 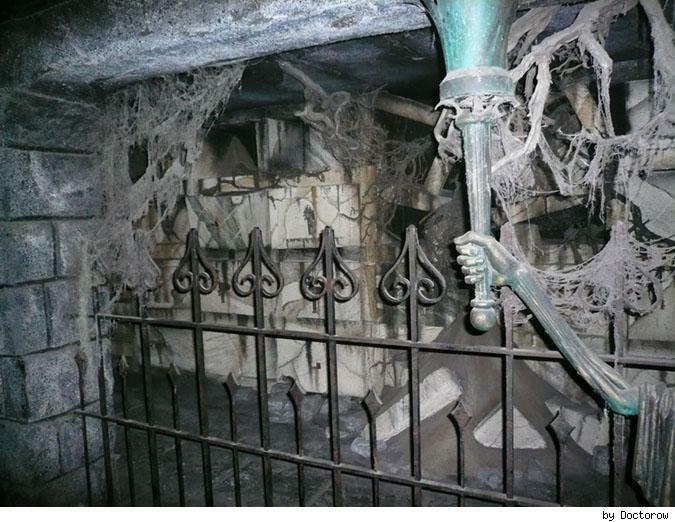 The audio-animatronics for the ghosts that appear on or near the floor are located below the mezzanine, while the audio-animatronics of the ghosts which appear near the ceiling are located above the mezzanine. 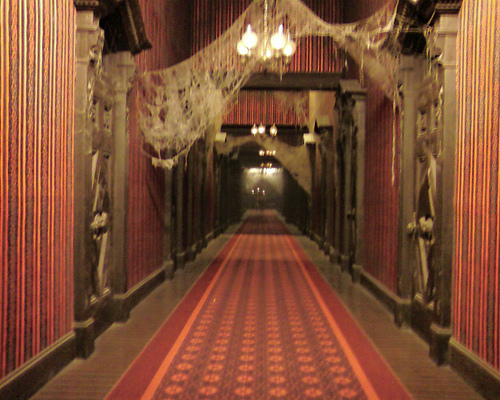 None of the reflections are at the guests' eye level, since that would require the audio-animatronics to be located in a place visible to guests. 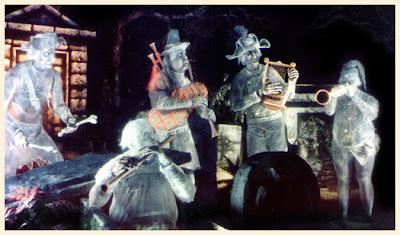 This scene was designed for the most part by Marc Davis, who designed all the humanoid spooks and portraits. It is the largest example of the Pepper's Ghost effect in the world. Disney used other techniques to make the graveyard ghosts appear to be ethereal. They are made of mostly translucent or transparent materials, which glow in the ultraviolet light that is used to light their scenes. They are made to appear blurry and indistinct through the use of scrims mounted between the guests and the ghosts. 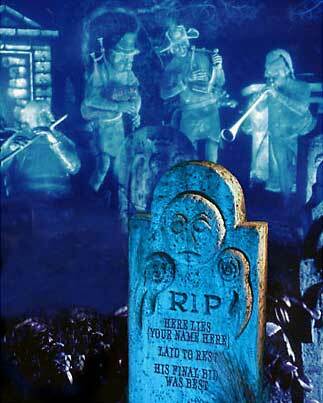 The mirrors in which guests see the hitchhiking ghosts are actually two-way mirrors. The ghosts are audio-animatronics in a room behind the mirrors. They move along in sync with the Doom Buggies, and weak lights shining on them allow them to be seen through the mirrors. 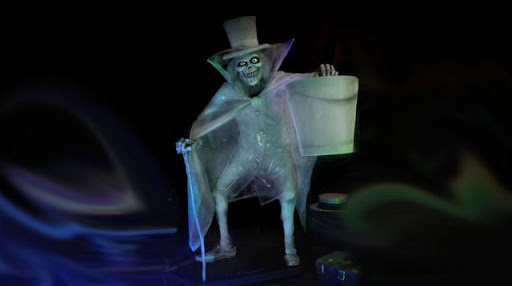 While Disney has claimed that the infamous Hatbox Ghost was removed from the ride during the first few days it was open due to being "too scary," it is believed that it was in fact the special effects that sealed the ghost's fate. The disappearing/reappearing effect could only be done through the use of strategic lighting, that once placed in the ride with ambient lighting, could no longer function. 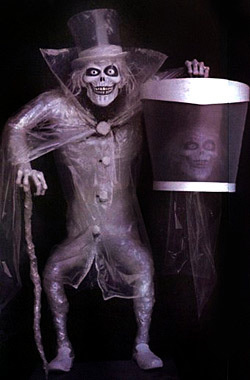 The effect was supposed to make it look like the ghost's head would disappear and then reappear in the hat box the ghost is holding. Though the ghost was briefly in the attraction you can still find plenty of Hatbox Ghost merchandise including pins and big figs.